← Let the NOM, NOM, NOM begin! 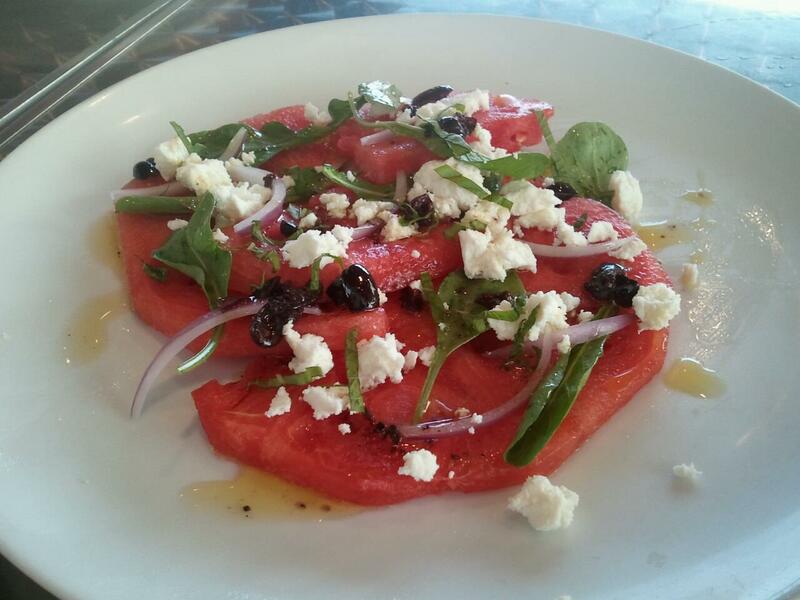 Dinette… a twist on your neighborhood pizza place. So in preparation for this weekend here in Pittsburgh, PA, I ‘googled’ the best of restaurants for the area and happened up on a great listing by PittsburghMagazine.com of the Top 25 Restaurants for the region. I looked over the list of locations and made a decision to focus on some moderate priced places that didn’t require reservations or a dress code. From the list, Dinette stood out to me for its simplicity of menu and concept. What I love about Dinette’s atmosphere is the fresh yet fun style; white walls, bright orange chairs, chrome tables, clear glass and open kitchen concept with the fire pizza oven. The staff represents a fun and funky mix with a refreshing care-free attitude. Given the great food they create, I could easily see them going a more upscale (and possibly pretentious) route. However I truly enjoyed their vibe and felt perfectly fine wearing t-shirt and shorts. Now the food, oh yes…it is delicious and worth a commitment to repeat experiences. (Given that I’m in Pittsburgh a couple of times a month, I look forward to broadening their customer base and bringing more folks in the near future.) Overall, the menu is refreshingly basic AND it changes daily! Ingredients help drive the selections and I love this idea. Granted I now have some personal favorites, so the luck of getting them again is up to fate; but I’m actually okay with that. The drinks, appetizers and desserts are a nice small ratio to balance the pizzas available. Since all three of us were together, we quickly decided that getting one of something and sharing all around was the best way to proceed. Beverages: Dinette offers a small selection of beers, sodas, espresso and bubbly quenchers. They also provide a lovely wine list that I regret I did not spend much time looking over. One highlight is that they have Yuengling Cans for only ONE DOLLAR! Kuh-razy, right?? Drew chose the Full Pint White Lightning which I tasted and fell in love with instantly; so I ordered one of my own. I’m not a big beer drinker but this Belgian styled wheat was refreshing and hit the spot. The Appetizers are in two categories: For the Table (to be shared with others) and Starters (just as equally sharable in my own opinion). We choose the Mixed Salami Plate (my choice), Grilled Shishito Peppers (William’s choice) and the Watermelon Salad (Drew’s choice). 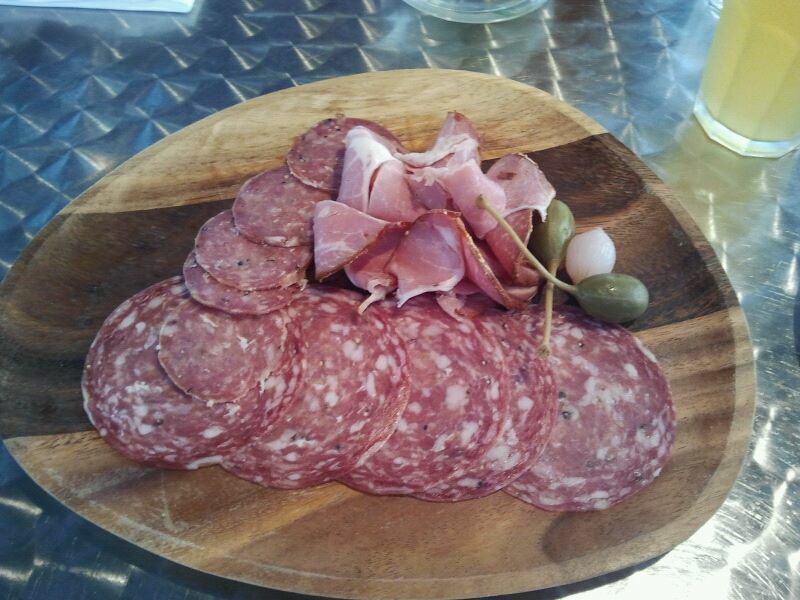 The Mixed Salami Plate was right up my taste bud alley. I love meats that are treated to create great fatty flavor mixes and these three hit the mark. The Hot Capicola has a nice hint of heat without being over bearing. The Soppressata is a lovely dry cured salami, smaller in size to what some think of as traditional salami which is great for an appetizer say on crackers or with cheese. The Rustico on the other hand is the larger sliced salami that I would easily use for sandwiches when compared against major label pre-sliced meats (meaning turkey, bologna, chicken etc). The Grilled Shishito Peppers were surprisingly mild and truly stand out in my food memory as something that won over my skepticism. Seeing the peppers with drizelled oil had me initially thinking heartburn city. However what Chef Sonja Finn created was absolutely right on. 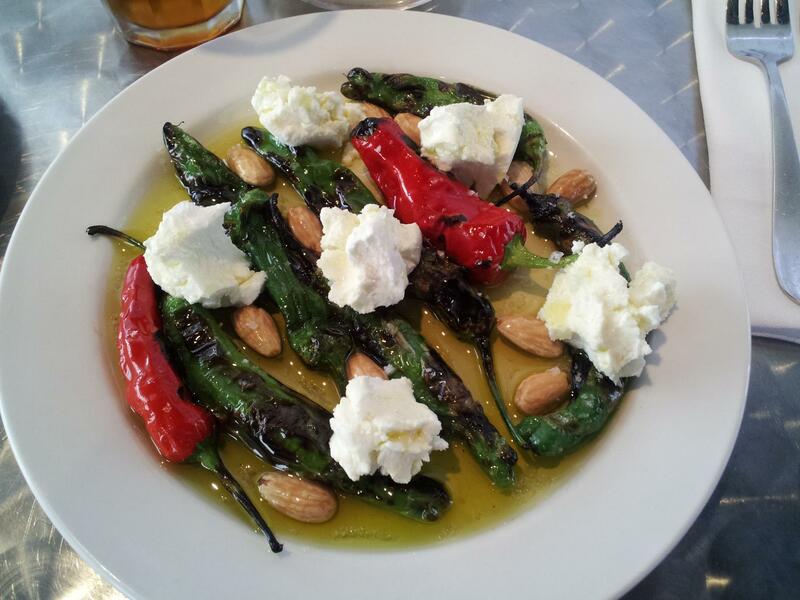 We easily recognized that the perfect bite was making sure you had the grilled pepper, goat cheese and fried almond together. The creaminess of the goat cheese playfully balances the mild spiciness of the pepper while the oil and fried almond provide that nutty/fatty element that makes the flavors sing when joined together. The Watermelon Salad completely converted me onto this food. I’ve heard of watermelon salads before but never really cared much and admitted to the guys that the idea of creaminess with watermelon didn’t sound appealing to me. Let me tell you that the blend of red onion, mint, basil, arugula, with manouri (semi-soft white cheese made from either goat or sheep’s milk) on top of juicy but firm watermelon is a refreshing killer! Now if only I can determine a way to recreate this at home… [and yes, that is one of my particulars – home cooking/experimentation]. The Pizzas: all made for one (lovely 12 inch wood fired oven creations) typically have around four or five main ingredients. We decided on the Prosciutto (William’s choice), Pulled Pork (my choice), and Grilled Corn and Zucchini (Drew’s choice) selections. By the way, Dinette’s pizza crust is a great crispy yet chewy canvas to show off their well-selected toppings. 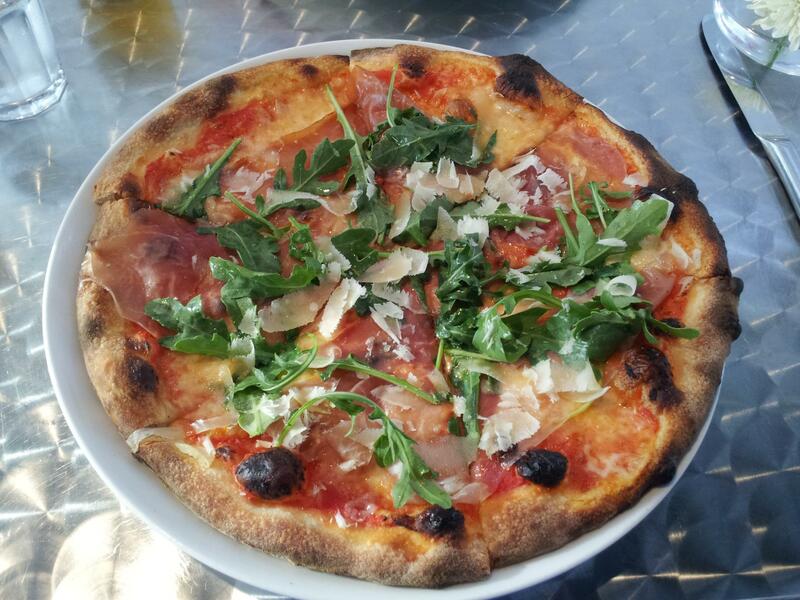 The Prosciutto with Arugula, Parmigiano Reggiano, Fresh Mozzarella and Tomato has me wondering how in the universe I ever worked for a national pizza chain and loved that stuff. The ham played well as a team with the parm and fresh mozz cheese to make a great (not overly) salty component to match up with the fresh arugula and tomato (sauce). I loved the two sides being brought together; the light and natural with the perfectly adapted. 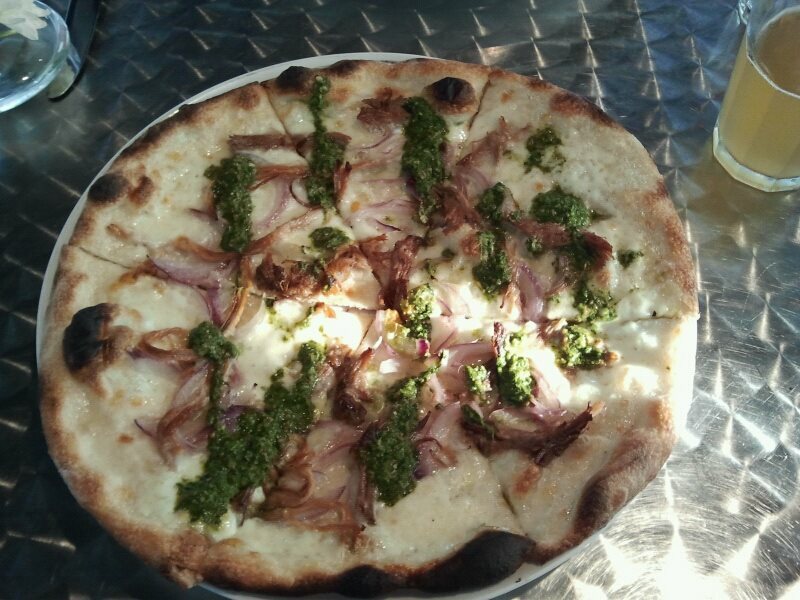 The Pulled Pork with Red Onion, Chimichurri and Fresh Mozzarella made me want to sing a gospel aloud; and I’m not even devoted to any organized faith! First off, I was truly disappointed, nearly heart-broken, seeing the limited amount of pulled pork visible. My nose was going crazy smelling the BBQ. Let me just state for the judicial record your honor, I am now a witness to a mind that learned something new. The lack of pulled pork on this pizza made me realize that discipline is something I need to learn more about, pronto. The chimichurri (a green sauce originating from Argentina, made of various finely chopped green herbs, garlic and oil) made a terrific herby element to interact with the meat/fat and lovely fresh mozz cheese. 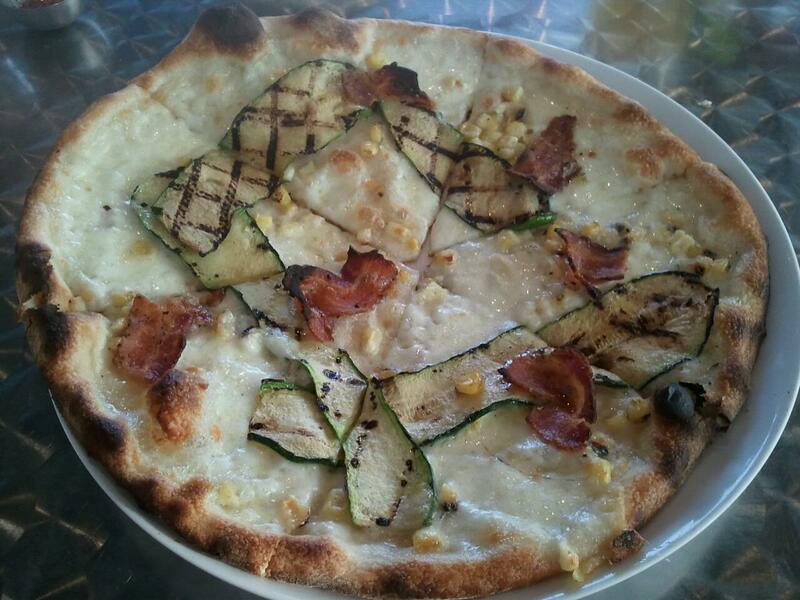 The Grilled Corn and Zucchini with Bacon and Fresh Mozzarella shows off farm freshness in a way that had me pondering the concept of grilling a copycat pizza at home this fall. Drew said it best, as we did our best to keep from drawing attention to ourselves, that when it comes to the flavor in this pizza, the nuggets of corn that pop in your mouth are a wonderful item of surprise and anticipation. The bacon of course was beautiful and properly proportioned and yes, I would have loved more because there’s never such a thing as too much bacon. But yet again, the restraint showed by the Chef’s staff has begun my learning curve. The zucchini was grilled with that always beautiful cross hatch pattern. Yet again, another work of edible art to enjoy for sure. The Desserts: perfectly matched to meet our needs; three in all were available, one for each of us. We choose the Chocolate Pot de Creme (my choice), Arborio Rice Pudding with Turkey Figs (Drew’s choice) and the Baklava (William’s choice). 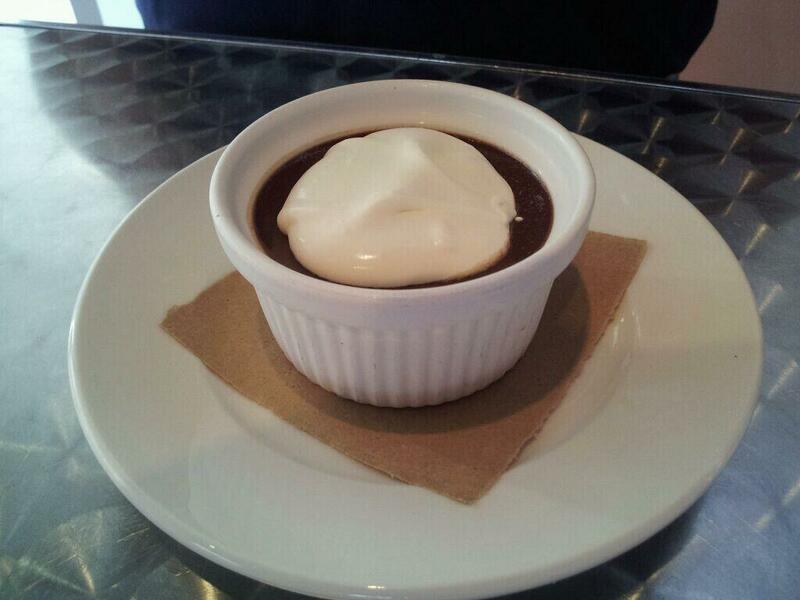 The Chocolate Pot de Creme lives up to its origins as a 17th Century French ‘pot of custard’ but with a creamy, smooth and tantalizing dark chocolate base. This is a great intense dessert if that’s what strikes your mood. 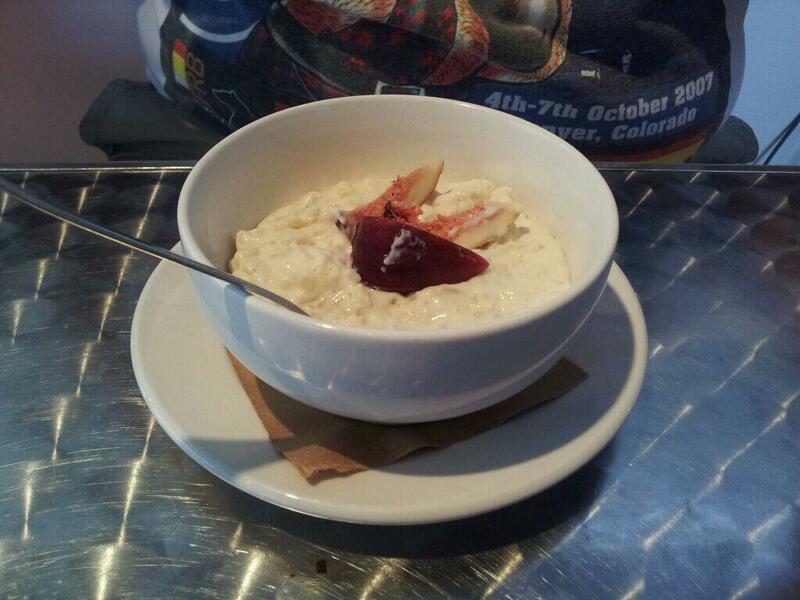 The Arborio Rice Pudding with Turkey Figs was my virginal experience with this thing called ‘rice pudding’. The idea of rice for dessert has never appealed to me. However, this first step in broadening my horizons was a revelation. I enjoyed the creamy consistency and striking balance of the fresh vanilla bean incorporated. The Turkey Figs are subtle and play the accompaniment role very well. This is a great light and enjoyable dessert with some volume but avoids the heavy feeling. 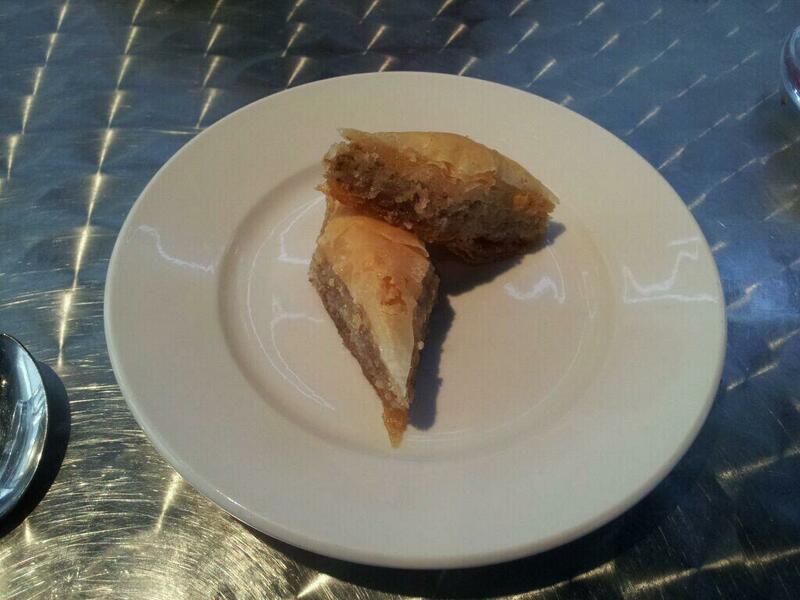 The Baklava made me wonder how someone came up with the idea for such a sticky, tasty yet evil concoction. I say evil because this truly is decadence that can cross you over into madness quickly. I noted that the honey used in Dinette’s Baklava truly brought this to a different level than the kind I’m used to having at the holiday family get together. Perhaps they used honey and rose water together… and if not, that gives me an idea. The portion is just right and lets you indulge in a guilty pleasure without feeling that you’re going to pay for it much in the future. This dessert is right down the middle, sweet but not overly so and doesn’t give you the ‘too full’ feeling. Overall: Dinette’s is a killer place that brings together people and food in an atmosphere that makes you feel as bright, fresh and fun all at the same time. I highly recommend folks check them out and enjoy a dinner date with someone special, friends or even your family. Kids are welcome and I was pleased to see them treats as the little adults they truly are. (more on that in a future post I’m sure) So if you’re in the mood for a new and refreshing take on the ‘pizza and beer’ scene, get over to Dinette (no reservations taken – and they get busy on Fri/Sat between 6:30p-8p) and enjoy! This entry was posted in Foodie Adventure, Gary's Stuff, Main and tagged Almond, Appetizers, Arugula, Bacon, Baklava, Basil, BBQ, Beer, Capicola, Chimichurri, Chocolate, Corn, Crust, Figs, Fire Oven, Fresh, Garlic, Goat Cheese, Grilled, Manouri, Mint, Mozzarella, Oil, Parmigiano Reggiano, Peppers, Pizza, Pork, Prosciutto, Red Onion, Rice Pudding, Salad, Salami, Salt, Soppressata, Tomato, Vanilla Bean, Watermelon, Zucchini. Bookmark the permalink.